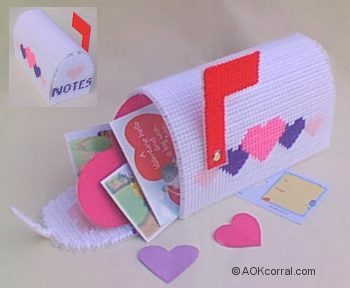 Learn how to make this cute mailbox for Valentines day or any day with our free plastic canvas mailbox craft project. The Easy Print Version contains all instructions and patterns for this project. The Easy Print Version contains all instructions and patterns for this project without margins, ads or logos. Click Here for Basic Plastic Canvas Instructions. Line up the holes of each piece you are working with. Start at one corner hole and bring your needle through both adjacent holes leaving a small 1/2" tail of yarn. Next bring your needle around and go through the next adjacent holes. Guide and hold the tail end of yarn to lay in the direction you are stitching so that it will be secured under the stitches you are creating. Finish your end of yarn by feeding it through a few of the completed stitches on the wrong side. Stitch both the sides (top) of the mailbox to the bottom piece along the sides that are 49 squares long. Next, stitch the back piece of the mailbox onto the bottom along the 23 square side. To stitch the rest of the back piece onto the mailbox follow the dot guides given on the back and side patterns. Stitch the front piece to the mailbox along the bottom only. Bend the tab toward the inside of the mailbox where shown on the pattern. To close, insert tab under/inside the top of the mailbox. Fun for kids and families to pass notes back and forth! You can also create this mailbox for everyday notes by just leaving the heart designs off and doing your stitching in gray or any color you wish.